Pacay Tree - ARTE AMAZONIA provides a global voice through art for the indigenous cultures of the Amazon. 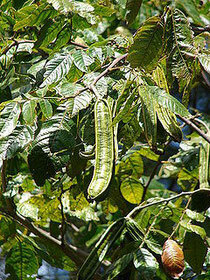 Inga feuilleei is a legume tree that is medium to large in length. Its height can reach an average of 60 feet or taller and will stand temperatures as high as 30 degree Celsius when mature. At low temperatures, these trees are often damaged. These trees generally occur near river banks, so it has year round irrigation. Inga species are dependable, they produce in abundance, and they provide sustenance in bad times. A family can produce food without occupying the farmland used for food crops, because they can grow on sites neglected by agriculture. Pacay is a legume, meaning it is a relative of green beans, snap peas, alfalfa, lentils, peanuts, etc. Being in this family, it bears an unusual fruit for a tree that resembles a giant bean pod, with a sweet, refreshing, cotton-like edible fiber on the inside. The pods are generally narrow, straight, and sometimes as long as a person's forearm. They can easily be cracked open to expose the white, sugar-rich pulp, similar to cotton candy, surrounding the seeds. In English they have been called “ice-cream beans” due to the sweet flavor and smooth texture of the pulp. Naturally growing Inga trees produce abundant root nodules, which fix nitrogen, thus adding nitrogen to the soil rather than taking it away, hence benefitting the land by increasing fertility levels. They grow rapidly, are tolerant of diverse soils, and are resistant to disease and fire. These trees are easy to establish, spread their shade quickly, and provide fruit for years. 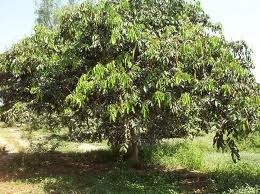 The fruits of the trees are quite edible and are often consumed by people of regions where this fruit grows. Pacay and other inga trees have important futures. They are multipurpose trees and are potentially valuable additions to gardens, orchards, fields, hedgerows, or wayside wastelands throughout most warm parts of the world. They also have outstanding prospects as urban trees for much of the tropics. In addition, the pod is also is valued as a shaker. These seed pods are dried out in the sun and also to create an instrument making a percussive sound.